Some of the best food photography blogs offer not only inspiration but also provide solid practical tips and advice. In fact, for those wanting to master the basic techniques of food photography, most of the essential info can be found online. Check out our list of the best food photography blogs for learning practical food photography skills. Those wanting to learn food photography often face a dilemma as to whether they should sign up for a food photography course or just try to learn on their own. With so many great free resources out there, you might well be asking what’s the point of doing a food photography course. But although there is indeed plenty of great info out there, it’s important to remember that most of these blogs offer food photography tips for free in the hope of getting you to sign up for one of their own courses or workshops (fine, they have to cover their expenses somehow). Clearly then, they are going to hold back some of the most important information, otherwise there would be little point in anyone stepping up to the paid version. Nonetheless, the free tips and advice some of these blogs offer can be really helpful for beginners. At the very least, they can be a great way of getting the basic knowledge under your belt beforehand, so as to be in a better position to get the most out of a course. And who knows, in some cases the paid or subscription food photography lessons offered by these blogs might even be worth it too. Here at Best Food Photography we have no direct experience of the premium content offered by any of the sites we review here. However, we can say that if we were in the market for such a thing, we’d put our trust (and money) in some of these blogs more than others. The majority of the blogs we feature here are clearly run by knowledgeable people with genuine professional food photography experience, and so they likely offer decent quality paid workshops etc. too. With that said though, judging by the quality of the free content provided, one or two of the others would not be worth investing good money in (or, to be perfectly honest, even worth just giving your email address to). For free though, they are absolutely fine. Especially if you are just starting out. With these minor caveats out of the way, which are currently the best food photography blogs for learning about the creative and technical aspects of food photography? A great resource for both beginners and intermediate level food photographers alike. Food Photography Blog features many articles containing well-informed – if not super-advanced – advice about shooting food photography and running a food photography business. Articles are written in a simple, informal style that never insults the reader’s intelligence, yet remains accessible and easy to understand. The site is also run by an active and experienced professional food photographer – LA-based Christina Peters – so you can be sure that the info provided is of genuine value. On the negative side, we’re not too enthusiastic about the mass-market web-design, but in reality this is unlikely to put most people off (in fact, quite the opposite). Really the only major annoyance, then, is a single pop-up window when first landing on the site. But this is easily dismissed and thankfully doesn’t come back to harass you each time you click on another page. Be prepared to hand over your data if you want the “free” e-books though. Food Photography Blog appears to be updated a few times each month and most of the posts are helpful and illuminating, so it’s definitely worth checking back for new material on a regular basis. 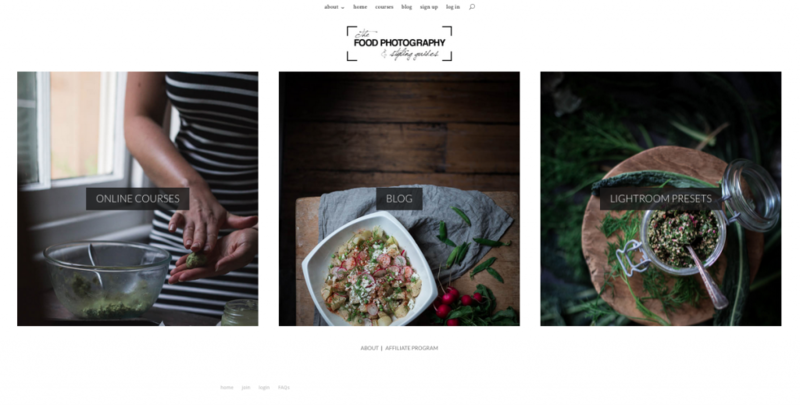 Without a doubt one of the best food photography blogs out there. Recommended! A quite recent addition to the food photography blogging niche, Food Photography Guides largely seems to exist for the purpose of selling food photography lessons and Lightroom presets (there’s a “welcome” pop-up again fishing for your data). However the site also offers a number of free food guides and tutorials on its blog to hook you in. If you are just starting out, there’s quite a lot of good advice to be found here, and the tone of the articles is personable and the content clear. Definitely one to keep an eye on in the future. Two Loves (presumably food and photography) is run by Rachel Korinek, an enthusiastic and helpful blogger in Melbourne, Australia. Rachel provides plenty of well-informed tips on food photography and styling, all delivered in a clear and interesting manner. She’s also very happy to engage with readers; offering plenty of feedback and advice in the comments section below. All in all this is a good quality, active blog that is clearly trying – and indeed succeeding – to become something of an authority on food photography. Although some might find the blatant commercialism and everyone’s-best-friend writing-tone a little annoying, the information on offer is of consistently high caliber. Indeed, this is a very serious contender for the title of best food photography blog and is well worth repeat visits. 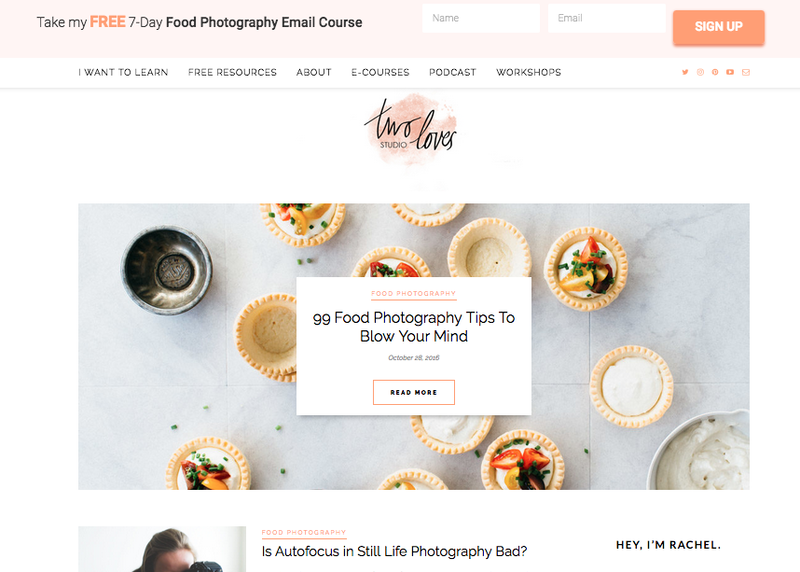 As with most of these sites, Two Loves offers a free food photography course in return for your soul. 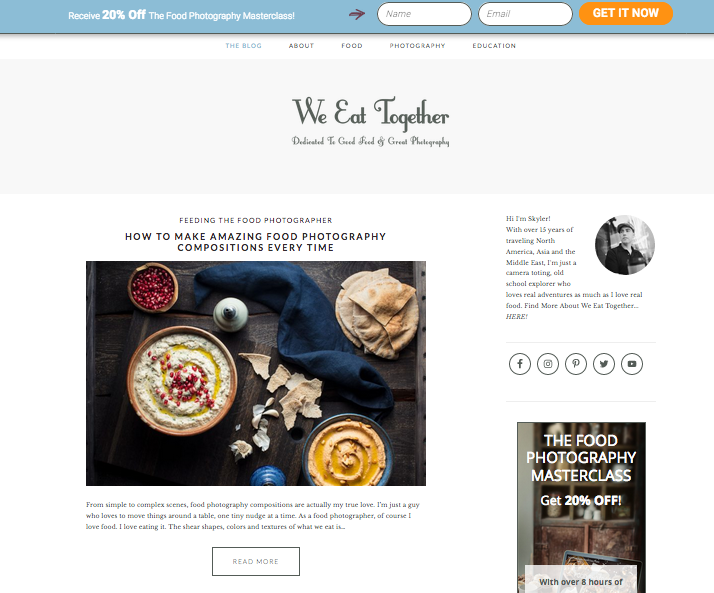 We Eat Together – run by another pro LA food photographer, Skyler Burt – is a font of genuine food photography knowledge from someone who clearly knows what he’s talking about. Although sometimes the writing and page-layout can be a little confusing (there are often just too many fonts all at once), it’s well worth persevering, as Skyler is evidently an experienced photographer with a lot of useful food photography tips to share. And while he’s knowledgeable about the technical side of food photography, he’s thankfully not too caught up in gear-lust. Once again, this blog isn’t offering free tips purely for the good of mankind though: in this case the product being pushed is a food photography video “masterclass”. Nonetheless, there’s stack of good free info on here, and we can fully recommend We Eat Together specifically for advice on food photography composition, lighting and equipment. 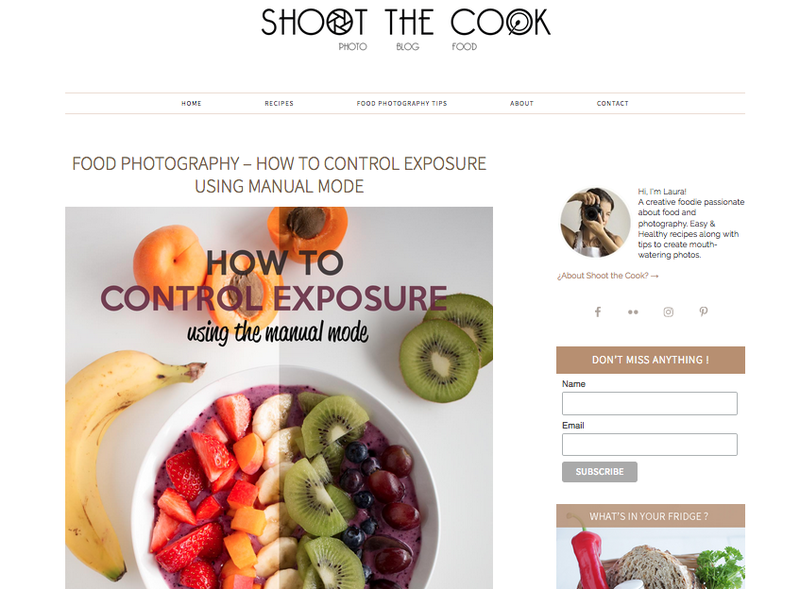 Shoot The Cook is run by Laura, a Dublin-based product designer by day, who shares a few of her food photography tips along with numerous recipes. Clearly Laura is still working out a lot of these things for herself, but if you are too, then it could be very helpful to tag along for the ride with her. All you need for taking good photos is a lot of enthusiasm and a small space no bigger than a school desk. Well, yes, that and a bit of talent and a whole lot hard work. But we salute the sentiment all the same, and Laura’s blog clearly shows that you can achieve a great deal with not a lot. Most of the articles to date deal with very simple beginner’s topics (the rule of thirds, for example), but Laura explains these concepts clearly and the text is accompanied by numerous helpful diagrams. The food is not always the most authentic looking (indeed we spotted one pasta dish that would have the average nonna Italiana throwing her hands in the air in dismay), but if you’re just setting out on the food photography path, then Laura’s lighting tips and essential food photography equipment lists could be a great source of info and encouragement. So, like, just the other day. Or was it the other week? Not that long ago anyway. There I was. Just looking at the internet. That’s right, the internet. Yup! And like, there were some words and stuff. Maybe even a few pictures too. Yes! Pictures! Aren’t pictures like, totally awesome? Anyway, there I was looking at the internet. And I found this blog. Or was it a website? Well, lets call it a blog for now OK? And it was talking about, like, food photography and all that crazy kind of stuff. And, so, like, I was totally reading all these words and things. And I figured that probably the guy must be like…12 years old. And suffer from acute ADD. And I felt sorry for the guy. ‘Cos you know, I’d feel pretty bad too if my private Whatsapp messages somehow ended up on the internet by accident and people started, like…reading them. 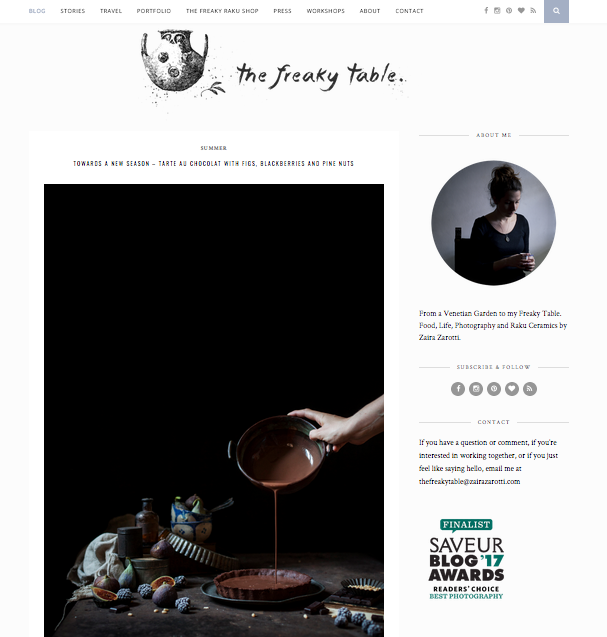 The Freaky Table is a somewhat pretentious blog run by a not-especially-humble Italian food photographer and ceramicist who has a penchant for heavy-handed Photoshop vignetting. We’re not really selling it, right? Bear with us though, because the author, Zaira, is clearly pretty well-versed in photography. Particularly the artier side of things. And interspersed between her self-indulgent pondering on the changing of the seasons in the garden of her “aristocratic” villa, the glorified vacation photos, and the rustic-bohemian posturing, there are actually some interesting ideas about food photography to be found on The Freaky Table’s pages. 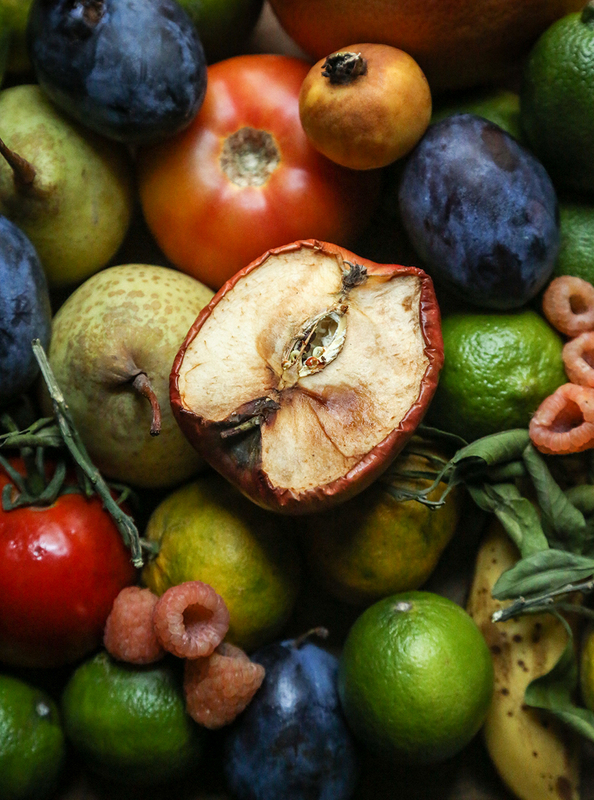 While only just scraping through onto our list of the best food photography blogs, The Freaky Table has something that none of the other sites we review here can offer: a more artistic and philosophical approach to shooting food photography. Anyone hoping to learn about f-stops and ISO settings will only be disappointed. Instead, come here for insight into the thinking and attitude behind the more creative side of food photography. And for once the site owner isn’t selling anything. So there you have it. These are what we consider to be the best food photography blogs for learning the art of food photography out there right now. 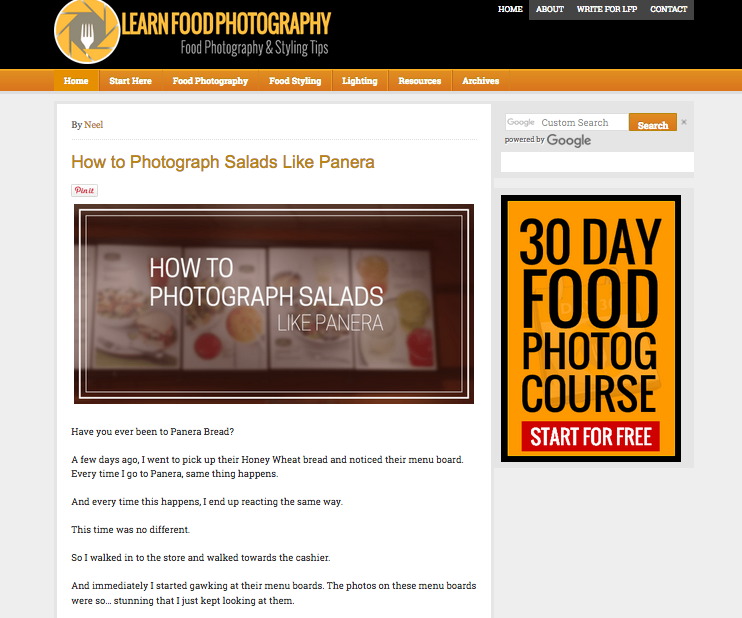 Of course, beyond these, you’ll also find lots of good technical info about food photography on many of the more generalized photography websites such as Fstoppers and Digital Photography School etc. But their posts tend to be a little less in-depth, and there’s a lot to be said for having a site you can regularly visit for new information as you progress with your own photography. 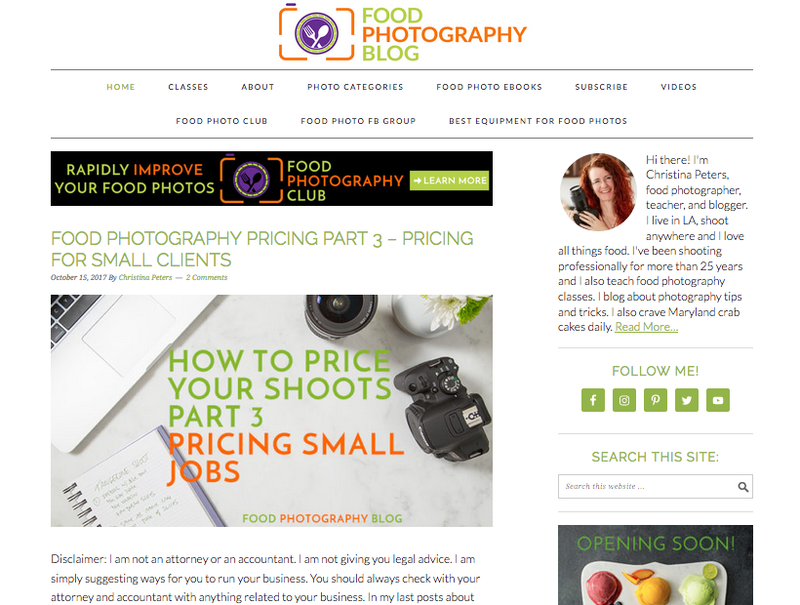 Check out a few for yourself, and perhaps you’ll find a new mentor for your food photography! What do you think of our list of the best food photography blogs? Did we miss any blogs offering valuable food photography knowledge? Let us know in the comments below! Thank you Skyler! Our pleasure!